Below is that part of John’s letter objecting to the Mary’s Assumption. He gives this as one of the reasons why he left the Catholic Church and joined one of the Lutheran Churches. The rest of the article is Lenny’s response to John’s very pointed objections. Perhaps you can share some of your insights. Here’s where things break down for me. Certainly, Mary had to be a great person to be chosen to bear and raise Jesus. Surely, this must be the greatest honor of all time… The Catholic Church reasons, she must have been bodily assumed into heaven. She was just too good to be rotting in the earth like the rest of us. That is quite an assumption!… Tell me, Lenny, what has your research found? When did this belief in the assumption originate? Did a Pope declare it? Which one? Why wouldn’t something of this significance be recorded in the Bible? 1. Mary rotting in her grave. 2. 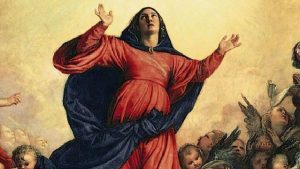 The assumption of Mary is not in the Bible. 3. The Assumption of Mary defined November 1st 1950. 4. The assumptions of Enoch and Elijah. 5. Non-Catholics teach the ascension of Mary. 6. Lutheran minister, why all the fuss about Mary? 7. Where are the Bones of Mary? 8. The mighty one has done great things for me. 9. The oldest records of the assumption of Mary, 100 to 200 A.D.
10. Rapture/Assumption or is it both? 11. Do Catholics worship Mary as a God? 12. Why do Catholics honor Mary so much? Mary rotting in her grave: Your statement; She [Mary] was just to good to be left rotting in the earth like the rest of us is not a real objection but a statement of mockery. John, perhaps someone said this to you and not knowing how to respond to it, you simply caved in and concluded that Assumption of Mary is not real. Would you say that Lazarus was to good to be left rotting in his grave when Jesus brought him back to life? The dead man came out (Jn 11:44)?Would you speak this way about the people who came out of their tombs after the death of Jesus? Tombs were opened, and the bodies of many saints who had fallen asleep were raised, And coming forth from their tombs after His resurrection, they entered the holy city and appeared to many (Mt 27:52-53).Were they too good to be rotting in their graves? You should not mock something you do not believe just because it is not the norm. It is true that Lazarus physical body being brought to life after death is not the norm. And it is also true that people coming out of their tombs and appearing to others is not the norm. They are the exception, but that does not mean that they didn’t happen.